The body of a Plexus unit can be fabricated from a variety of options, including louvers, metal grates and fabric. They can provide full shade or little shade depending on the needs. Also, corrosion will never be a problem because the bodies of these units are composed with fully powder coated aluminum components. -A high quality welded aluminum product that is typically designed to cantilever around 4′-0″. It is not mechanically screwed. -Each canopy utilizes high strength 6061-T6511 aluminum flat bar as outriggers which mount to the wall with 6061-T6 aluminum angle. -The outriggers are connected to the mounting angle with three 3/8″x2″ 18-8 Stainless Steel hex bolts, which is supplied by Datum. Every Datum Metal Canopy is designed and fabricated with exacting standards. 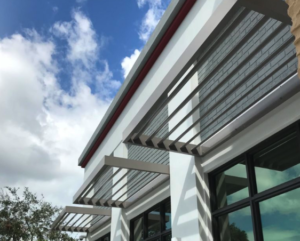 This means that after every fabrication and assembly, each canopy is fully painted with a polyester powder which is designed to meet the performance criteria of the AAMA 2604 coating specification.